I just received an interesting email indicating that I could have the opportunity to ask a question to Bill Gates. Well, there is a small catch (of course). I (and everyone else on the planet) can submit questions and the “best one” will be chosen and asked of Mr. Gates…. I have no idea what criteria will be used to determine “the best” question…. but I thought it might be an interesting chance to recommend a question. Another interesting aspect of this that I didn’t realize until I followed the link, is seeing what others are suggesting…. Some are serious, some are funny. I thought it might be interesting if it happens that A LOT of LIBRARIANS suggest questions. (Who knows, maybe one will even be the “chosen” one.) I think it would be interesting if there were so many suggestions by librarians, on this otherwise non-library-related site, that the general public (or readership of this site) noticed. I wonder what they would think. I wonder what, if anything, would happen. We out here in library-land have had our own “dealings with” Mr. Gates and we may have some specific questions we want to ask him….. This is all taking place over on FastCompany.com – a magazine and site I really like. In fact, I have been thinking about doing a post about their site ever since I joined it because I think it is an interesting approach and one that libraries should consider. So I have my own area with any messages or other information I might want – and I have controls on the right to edit my profile, post, invite others, send a message, etc…. Some libraries ARE doing things like this on their website, or on another virtual presence, and I am certainly not the first or only to call for this. However, not enough are doing things like this. As I was signing up for my account on fastcompany.com I couldn’t help but think about library websites as I went through all of my options and interests…. What topics am I interested in? Which newsletters and updates would I want to receive. What do I want my “homepage” to look like when I come here and sign-in… these would all be great features on a library website. I know it might be small here, but in that red box I’ve drawn I have all these MY things, and they literally say they are MY things: MY contacts, MY bookmarks, MY feeds, MY settings, MY network, MY recommendations, etc…. this really makes this MY page to me, for me, when I come to this site. It also makes it much more specific, interesting and useful to me. I have already narrowed-down what aspects of this page/company I am interested in… and it is all ready for me right on the front page FOR ME when I sign-in here. Maybe these are not earth-shattering things, but it seems to me that I am seeing more and more websites like these. Library websites are already, for the most part, behind the times, and as more of these sites go to more and more personalized interfaces, we don’t want to be another generation behind. So, anyway, submit your potential question for Mr. Gates (by posting it in a comment on the post) and also take a little tour around FastCompany.com … and my.barakobama.com, if you’re so inclined. Entry filed under: Technology. 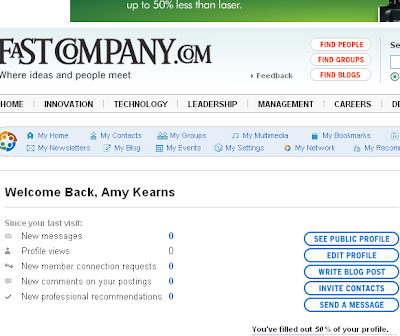 Tags: Amy Kearns, bill gates, fast company, Libraries, websites. Amy, I TOTALLY agree w/ you. I was just talking w/ the director of our library the other day about how our industry needs to catch up on the fully-customizable, personalized, self-service websites that everyone-else-but-libraries have had en masse for what seems to me like years. I’d have preferred us to be driving the bandwagon instead of running behind it, but i guess at least it’s in view. We could do all of that, of course. We have the same technology that everyone else on the web has. But there’s the small matter of patron confidentiality, and of not collecting any data that the FBI could come in and slap a national security letter on you for.